Secured with Edge-Lock - No Tape or Glue Needed! Use them for packing promotional items and products, to wrapping gifts and party favors. These low cost boxes are great for making a stylish and exquisite presentation with premium, thick stocks and bright, full color graphics. 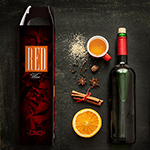 An exceptional custom design can have a powerful impact on customers, clients, or anyone receiving your boxes. Strong, durable stocks protect the enclosed items from damage, even in transit, making them perfect for shipping items at high quantities. Choose from our two premium card stocks to suit your needs. For a natural look, our 14 pt uncoated card stock is economic at our lowest prices. For added gloss and elegance, select our durable 18 pt coated card stock. 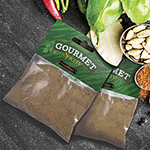 We guarantee to deliver top-quality printed materials for any of your packaging needs. Pillow shaped boxes are made from heavy-duty, durable materials and can hold many different small items. These pillow boxes are designed with edge lock to enclose items and a side tab for easy opening. To economize space and prevent damage in transit, the boxes ship flat, but assembly is fast and easy! Simply fold your boxes along the designated folds and into the edge-lock mechanisms. No tape, glue or other sealants are required. Our low cost pillow boxes are available in both short-run and high quantity printing to suit any of your gift, storage or packaging needs. Give a unique, sophisticated presentation for any of your products and increase brand recognition with an outstanding design. Our boxes are made with strong, durable stocks to enclose and prevent damage to any of your items. We print in vibrant, full color to bring your graphics to life and create a sunning product that your customers will want to hold on to. 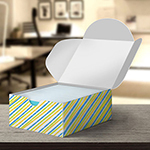 Try our full color medium box packaging printing or custom made small box packaging printing for your gifts or products. These pillow shaped boxes are perfect for packaging small products or promotional items, and with a great design, can make an impact on awareness of your company or brand. Full color printing for pillow boxes will advertise your company by capturing attention and intrigue, so current and potential customers will remember your product or logo. Create your very own eye-catching design that will get your company noticed. Bright and vibrant graphics will stick out the most, but make sure your design reflects the nature and atmosphere of your company or what items you are providing. Our full color custom pillow boxes are a great way of packing gifts or party favors with a standardized yet elegant method. Present your friends or coworkers with chocolates wrapped in delightful pillow-shaped boxes around the holidays. Fill these pillow boxes with candy, potpourri or small trinkets to use as wedding favors. Add a personal touch to your custom pillow boxes with a bow, or use them as personalized place cards for your event. 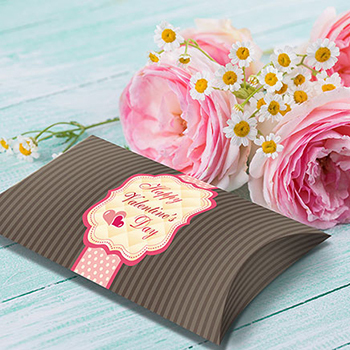 Our high-resolution, full-color printing will make the graphics and design for your custom pillow-shaped boxes pop, and the boxes will be a unique gift within themselves. These boxes are especially popular for holding glasses and sunglasses, and the material is so durable, the boxes can be used for storage again and again. Pillow boxes are also ideal for packaging jewelry and cosmetics at a low cost, while still maintaining an attractive exquisite presentation. Pack your products in these pillow shaped boxes for added protection and appeal, or use them for an effective marketing campaign. If you run a salon or spa, consider giving your customers some samples of your products to take home with them in a pillow-shaped box. Your customers will be so impressed by both your generosity and your beautiful custom box, they will surely come back. Product recognition makes your company memorable, and providing exceptionally presented promotional items will increase your reputation and sales. Cute and fun for giftwrapping. Thanks for a great product! Beautiful boxes, color was spectacular. I filled them with bath products to give to my bridesmaids and got many compliments. Thank you soo much! !